In the Age of Trump, we Americans live in a giant tinderbox. And we're fighting over everything. Black Lives Matter. Blue Lives Matter. All hell breaks loose when Blue Lives shoot unarmed Black Lives. These skirmishes break out amid the larger struggle over the strategic crossroads of race and inequality. Also in these fraught times, the battle over the Rebel flag and Confederate monuments still rages, and Lost Cause aficionados still cry over their spilled "heritage" as they wave the Stars and Bars in the face of civilized humanity. Sometimes, one stumbles into a situation where two or more of these things converge, which today quickly could become a Situation. So . 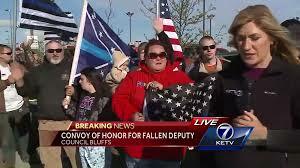 . . welcome to an impromptu pro-police demonstration in Council Bluffs, Iowa, following the fatal shooting of a Pottawattamie County sheriff's deputy -- white -- by an escaping inmate -- black. The gathering along Broadway Avenue consisted of members of a Facebook group for off-road enthusiasts -- at least two of whom also are enthusiasts for something else not usually associated with Iowans. Iowans, that is, who aren't Republican congressmen named Steve King. THE GROUP of Counciltuckians -- and displays like this are why people across the Missouri River call Council Bluffs Counciltucky -- waved at least a couple of Blue Lives Matter American flags, a couple of regular Star-Spangled Banners and. . . . I swear to God, I didn't even know this was a thing.
. . . at least two Confederate battle flags that had been Blue Lives Matterized. In Iowa. Again, by people not Steve King. Are you seeing where this could all go horribly wrong? Are you sensing that at least a few of these folks, in addition to saying police lives matter, might be saying that black lives do not? And that one of the Molotov cocktails we Americans so love to use for a pepper game -- when you win, you lose -- is somehow part and parcel of cop killings. 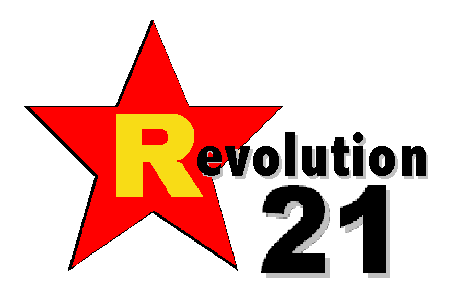 I don't know about you, but my inclination is to ask the Rebel-flag wavers "What the hell are you thinking? Why the hell do you think this is appropriate? What exactly are you saying here?" I'm curious that way. I imagine the Blue Lives that these people seem to think Matter might like a bit of insight, themselves. "Intelligence," I think they call that kind of information. MANY REPORTERS might like to know, too. Then again, maybe not. Too many journalists today operate under the same "narrative pressure" local TV reporters face at times like these. Dead cop. Ordinary folk show their love and support. Tears. Respect. Cue somber outro music. Fade to black. Even so, I don't know how a reporter ignores the flag flying right in her face, but there you go. Confederate flags do not fit The Narrative -- at least not in the Midwest. And I suspect that even in the former Confederate States of America, there would be hell to pay if they did. The descendants of slaves tend to get touchy when white folk celebrate a society predicated upon their ancestors' suffering. And just like those who embrace the Rebel flag must let go more important things to take up a tainted standard, journalists who stick to the feelgood, feel-bad Narrative are, in their own ratings- and circulation-driven manner, doing exactly what Confederate enthusiasts do in the South and -- one presumes, because Counciltucky -- elsewhere. They whitewash fact so we might live an alluring lie where we all love the cops, the cops all love us, and everybody does it out of the goodness of our June and Ward Cleaver hearts. In The Narrative, communities are good, communities pull together and no one scapegoats, stereotypes or has ulterior motives. 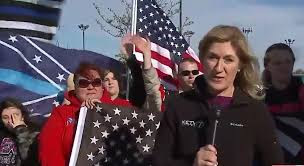 Never mind those people waving the Rebel flags, banners the Channel 7 reporter seems to think will cease to exist if just she ignores them hard enough. It would have been such a simple question: "The Blue Lives Matter American flags, I understand. But why the Confederate flags?" It's a simple question that wasn't asked by reporters for the Omaha World-Herald, either, even though the newspaper made note of the flag-waving off-roaders and even ran a picture of them. Sans Rebel flag, of course. Perhaps the answer is the fewer questions you ask, the better off you are in post-truth Tinderbox America. Until, of course, you aren't.